It amused me, mostly because her definition of 'almost falling' is probably the same as anyone else's definition of 'definitely falling.' Her mom followed into the room behind her, rolling her eyes, and undoubtedly wishing that Melissa would be less clumsy or more attentive or perhaps both. Parents have a unique way of perceiving current problems by projecting them into the future and worrying terribly about whether or not their child will be able to meet the demands of the world and of course meet their greater aspirations. This puts parents into points of conflict with teachers or other school personnel who tend to perceive problems measured against current situational and contextual demands, based on a more relaxed sense of normative functioning and broader tolerance for a range of performance. Measuring performance with a present-based normative model vs. a future-based criterion model creates a situation where schools and parents are often speaking different languages. The point of this is that the school tends to have little interest in Melissa's tripping around the classroom because even though she is clumsy she can function despite the difficulty, whereas the parent frets and worries that Melissa might forever lack competence and what if in the future she trips and drops an important architectural model for some new project, which of course will cause the firm to lose the contract, and will cause her to lose her job. Truth almost always exists somewhere between the extremity of these two perspectives. It is true that there are very few architects who are so clumsy that they are jeopardizing their jobs because of their motor incompetence. However, it is also true that if Melissa is so clumsy as a child that it may impact her self confidence and school performance to the degree that it might have an impact on her occupational trajectory. This is why I create room in my practice for children like Melissa. I have understood for a long time that although the criterion of parents that triggers their pursuit for intervention may fall within the tolerance range of school districts, this should not restrict the freedom of moms or dads to do the things that they want to do as parents for their children. I suppose that I have developed my own set of criteria as well so that I can help parents understand if their own expectations are out of whack, but it is rare that I need to pull parents back from a brink of unhealthy expectations. The end result is that I am a partner with families, often working along with them to try to solve complex problems that impact children's function and performance. Sometimes the pursuit of answers to problems takes me to funny places. Other parents understand this well, often nodding their heads in agreement or understanding or both when I try to describe what I do. Other times I find myself trying to explain these complexities to people who struggle to understand the point. Anyway, Melissa is a good example – she can't figure out what shoes go on what feet and this is all related to her impaired perceptual motor skills. However her language skills are significantly advanced, to the point where she can entertain and engage an adult in conversations that are far beyond her chronological age. In school she can read but not write, but at this age there is little expectation for writing, and so her performance falls within the broad range of tolerance. There is no therapy in school for her based on his overall performance and this is why the parent is bringing her in for private therapy. Melissa seems 'smart' and 'competent' to most people because her language is so advanced, but the parent is concerned that she can't hold a pencil and she can't walk without tripping. The initial goal is to get her to wear shoes on the correct feet, but she is smart and she resists intervention – perhaps because she is already developing a sense of not liking to be incorrect. This is a natural compensatory response for a bright child – why would she want to be told she is wrong – so she uses her language skill to try to walk circles around people when they try to engage her in conversations about learning left from right. I have tried nearly every trick I know, but she remains resistant. 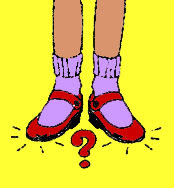 Last week I made up a tall tale and told her that even I mixed up left and right so I have to put a piece of tape in my shoe to remind me which is which. I taught her how to look at her hands and how her LEFT hand makes a natural 'L' shape when she holds her thumbs away from her hands and looks at them. Of course she didn't believe me, but I planned it well before the session so I took off my shoe and proudly showed her the large piece of tape with the letter 'L' on the insole of my left shoe. I showed her how I check to see which hand is my LEFT and how that helps me know that I have to put the shoe with the 'L' on my LEFT foot. She was intrigued, and promised to think about it. I paused for a moment, wanting to explain about normative vs. criterion based expectations, about the worries and fears of parents, about the intransigence of highly verbal children who have mild perceptual motor delays, about my own willingness to tell tall tales in order to help families get their children where they want them to be, and so much more. A few dozen people stood in silence – hanging in expectation of a response that wasn't happening. There was too much to explain, and not enough time, and I began thinking that this was going to turn into a blog story. I don't think any of the people who were at the airport will read this, but if they do, now they will understand why the middle aged guy in the security line has to label the insides of his shoes so he knows what feet they go on. Phew Chris. You need to cut down some of those sentences and we'd all understand your writing a lot better! Wonderful story about how OTs are creative and humble in their day to day work. Cheers, Anita. I disagree with the first comment. I think your point is quite clear. As someone who has worn both hats, parent and a PT, I don't always consider the perspective on a school's opinion of living in the moment vs a parents looking to the future. This explains why opinions can sometimes clash b/c we the end goal is not the same. This is where communication is key. Chris, I thought the tone of the post was wonderful -- I could "hear" you telling the story. Thank you for this post - I just found your blog after putting Occupational Therapy and Behaviour Problems into google... anyway this was interesting to me becouse the problem I have with my son is that he a 'typical' busy boy according to friends and family but he has issues with language explaining himself and keeping up in class he has a diagnosis for ADHD and is being medicated. We will be told in the new term that he will have to go to OT as amatter of course but I dont understand what OT has to do with behaviour problems. He is busy and he is smart (super smart by some peoples opinions) he just doesnt listen and he doesnt really know right from wrong or left from right ... i am going to try that neat trick with them (both kids) and see if that helps even a little bit. Thank you. Thanks for your comment... I was a little confused about the idea of participating in OT 'as a matter of course.' There should be an evaluation and hopefully that evaluation will demonstrate some link between the difficulties he is having and the intervention that is proposed. I encourage you to talk to the OT and see if they can help you understand the evaluation and reason for the services. Thanks again for writing! !